While the recent 50th anniversary commemoration of the "March on Washington" to demand rights for African Americans focused attention on Martin Luther King, Jr.'s unfinished domestic agenda in the United States, Dr. King was also strongly committed to a global human rights movement, particularly related to Africa. In 1957 he visited Ghana for the presidential inauguration of Kwame Nkrumah. During and after that trip, he spoke frequently of what the U.S. civil rights movement and anti-colonial movements in Africa shared. "Our struggles are a common struggle," he asserted. A half century later, Africa has progressed dramatically, with most African nations holding democratic elections, reforming their economies and building peace. But for millions, equality is still a dream, and peace is still a promise. For example, the two deadliest wars in the world since the March on Washington have been fought in Congo and Sudan. About eight million people have died in those two conflicts, with millions more driven from their homes by terrible human rights atrocities. In 1963, Dr. King understood that apartheid and colonialism were rooted in racism and economic exploitation. Today, racism and economic exploitation are at the heart of crises in places like Sudan and Congo. In the same way that the civil rights movement demanded peaceful change in America in 1963, brave citizens in Congo, Sudan and elsewhere across the continent are standing up today for peace, justice and freedom despite grave personal risk. These activists, who are living Dr. King's struggle in their own countries, deserve the support of Americans, just as American civil rights activists received support from around the world for their efforts. Dr. King pressed repeatedly for a boycott of the apartheid regime in South Africa. This helped inspire a global anti-apartheid movement that eventually helped free Nelson Mandela and see the end of legalized discrimination in South Africa. That in turn inspired the movement against blood diamonds that helped end three African wars: those Liberia, Sierra Leone and Angola. That further inspired the Darfur anti-genocide movement that forced the Khartoum regime to allow life-saving aid for hundreds of thousands of people. Read the full op-ed on AllAfrica. 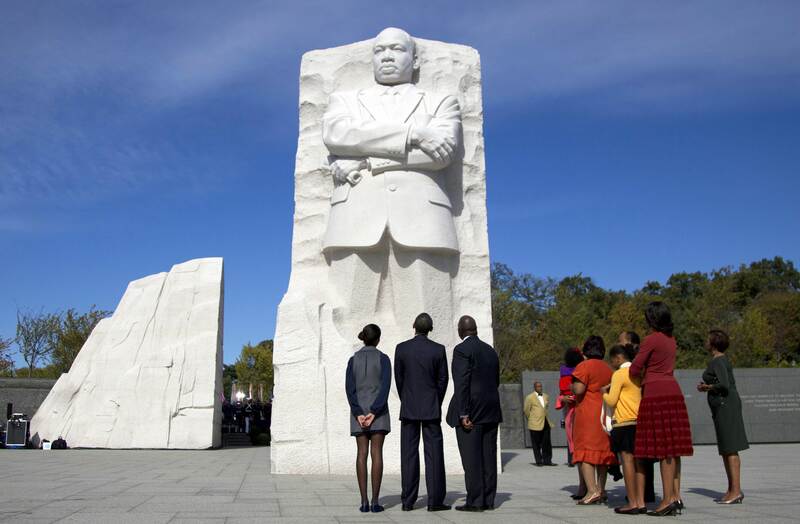 Photo: The First Family in front of the MLK memorial (AP).